Update 2018: Scilly Cay is currently closed, will be re-opening winter 2018. Updates to come. Set on a tiny island off of the coast of idyllic Island Harbour in East End Anguilla, Scilly Cay is a gem of a spot. Serving cool rum punches, tasty lobster, crayfish and pasta salad, the food is just as impressive as its five-star location. Our family generally tries to avoid "tourist traps." For example, we've only ever been to Disney World once... for ten hours. Fun, but we like to travel. I guess you can say that's one of the reasons that Anguilla attracted my Dad in the first place. A place has to earn its keep to stay in our hearts. 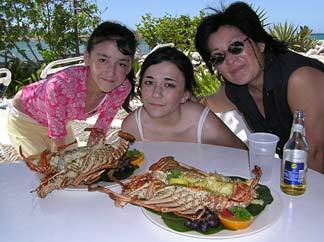 Its wonderful people, perfect beaches, and fine Anguilla dining have made us forget about old favorites like Hawaii. 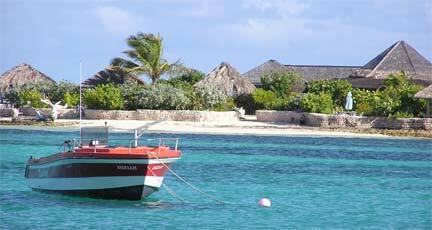 Of course, even an "off-the-beaten-path" place like Anguilla has its "must see" tourist spots. 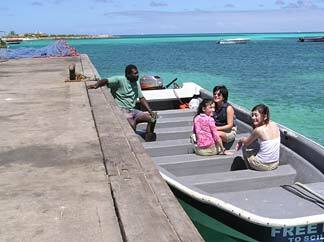 Scilly Cay is one (see below). 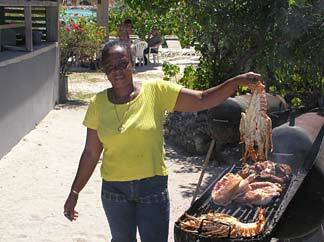 But we keep receiving wonderful comments about Scilly Cay, especially the ambience and the lobster. "Ambience and great lobster -- let's try it this time!" If the boat's not there, just wave at the island. It'll be there in a few minutes. And so, yep you guessed it, the Scilly Cay adventure began. A charming gentleman name Julius "Africa" picked us up. He told us quite a bit about Scilly Cay. 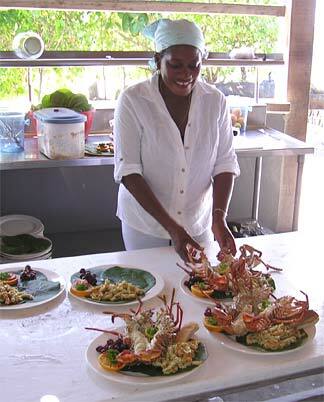 And, if you're cooking at your own villa, he can also get you fresh fish and live crayfish and lobster. The waters within the bay are always calm and we were there before we could say "Scilly Cay on a Fine Day"! Julius is one of the nicest guys you could meet. From the moment we stepped onto the dock, I thought to myself "I've never seen anything quite like this." Certainly not your everyday diner. Not even your everyday "Anguilla diner." It's the only building on an island in the middle of a bay. With a panoramic view of Island Harbor. No electricity. So everything is grilled. Fresh salad. Cold drinks. Stranded on a desert island could be tougher, I suppose. Right after ordering, we had to stretch our legs and see what we could see. We found some pretty sensational driftwood. 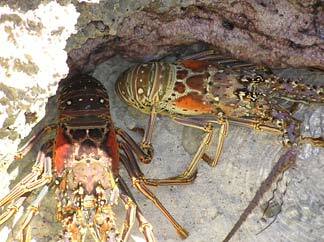 First, we found how they keep lobsters alive without an aquarium (no electricity, remember?). 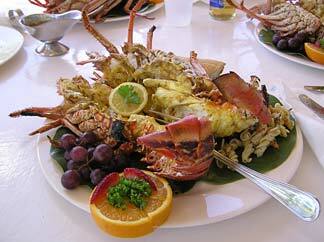 The lobsters are caught a ways offshore, then brought here. They store them in natural tidal pools! Perfectly spiced. Garlic butter. Warm French bread. Fresh pasta salad. Al fresco Anguilla dining. It doesn't get better than this. The clean, spacious, and relaxing atmosphere, all on an island of its own, gentle tradewinds blowing put us at the most peaceful ease. We love waterfront "lobster shacks." Well, this was nicer than a shack and we were literally surrounded by the water! Eudoxie Wallace... the owner of Scilly Cay (along with his wife Sandra). 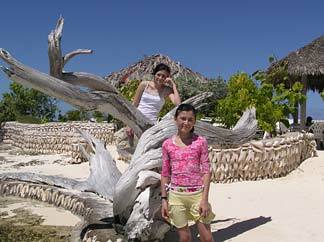 Apparently, when hurricane Luis came, this little island was wiped clean. They rebuilt and have been doing fantastic ever since! 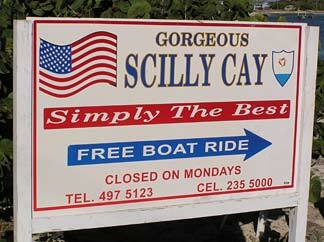 Directions: Scilly Cay is a 20 minute drive from West End Anguilla. If you're staying in the Shoal Bay area, you are only 5 minutes from Scilly Cay. See the map below for exact location. Good for long beach afternoons of rum punches and BBQ. Hours: During the day on Wednesdays and Sundays.